The Fly was the creation of Joe Simon and Jack Kirby, the team responsible for The Boy Commandos, Captain America, and many other classic comic book series. They submitted the character, under the name "Silver Spider", to Harvey Comics in the mid-1950s, but never got a go-ahead. When Archie Comics commissioned the Simon & Kirby studio to create a couple of new characters for its revived adventure line, they dusted it off, changed the arthropod in the title so nobody would know it was a retread, and sent it in. (Another superhero partially based on the old Silver Spider proposal is Spider-Man.) With a first issue dated August, 1959, Adventures of The Fly was the second of the new line to appear just two months after The Double Life of Private Strong, in which Simon & Kirby revamped the publisher's old Shield character. Jack Kirby drew only the first and second issues. By the second, The Fly had become an orphan in more ways than one The Shield's comic met early cancellation, leaving Adventures of The Fly the only title in the Archie Adventure "Series". It was 1961 before another adventure character, The Jaguar, was added. The Simon & Kirby Studio put together only the first four issues, after which Archie Comics handled it in-house. Departing with Simon & Kirby was Little Tommy Troy, the orphan. The fifth issue opened with a grown-up Thomas Troy hanging out his shingle after graduating from law school, and thinking about his old magic ring for the first time in years. With that single stroke, the child character was relegated to the distant past, and Adventures of The Fly became an ordinary comic about an ordinary adult superhero with an ordinary adult secret identity. Several artists handled the character during the early years, including Bob White, who drew #5 in a style not much different from the one he'd used on Cosmo the Merry Martian. Eventually, John Rosenberger, most of whose comics work was in the romance genre, became the regular illustrator. He delivered dependable, routine work until 1964, when the title ended. Along the way, only one more notable thing happened in the 14th issue, The Fly picked up a female counterpart, Fly Girl, who was in reality actress Kim Brand. In 1965, the publisher tried a new tack. Now calling their superhero line "Mighty Comics Group", they hired Jerry Siegel (co-creator of Superman) to write their heroes in a pumped-up imitation of Stan Lee's Marvel Comics style, with Paul Reinman (occasionally supplemented by fill-ins from Mike Sekowsky) delivering a hideous parody of Marvel's art. 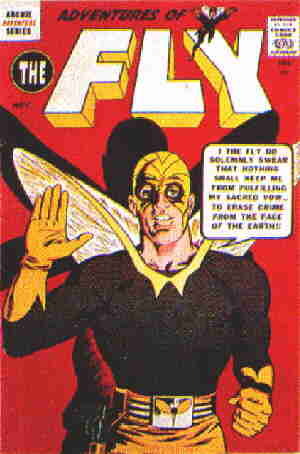 Re-christened "Fly-Man", The Fly played a large part in Mighty Comics' early days, and was, with The Black Hood, The Comet and others, a charter member of The Mighty Crusaders. When the self-mocking Batman TV show caught on, Mighty Comics over-did that type of self-mockery, too. The plug was pulled on it in 1967. Archie Comics tried doing superheroes again in 1983; and again, The Fly was prominent in the revival — but the line lasted only a couple of years. In 1991, DC Comics licensed the Archie adventure characters, and did a completely revamped version of The Fly for their !mpact Comics imprint; but that, too, was short-lived. The rights have since reverted to Archie Comics, which has always had its greatest success in teenage humor, not superheroes. Currently, the publisher is not making great use of The Fly, or any of its other super characters. But it keeps the trademarks current by devoting part of its Web site to them, and occasionally lets them turn up in a comic book. If they ever do another superhero revival, it's a good bet The Fly will be involved.